The Catholic Hipster weblog: Why I Dislike the "Dubia"
Why I Dislike the "Dubia"
There are few things that get my goat like Anti-Francis Catholicism. You know what I'm talking about: that strain of Catholic Twitter that isn't quite Sedevacantist, but has a problem with every single thing Francis says/does/wears/thinks about. 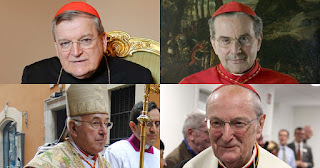 And while I'm not saying that the four Cardinals pictured above are of that sort, their recent "dubia" to Pope Francis has certainly unleashed the trolls who are and put a spotlight on division within the Church (even if it is being overblown) that we don't need right now. "Four semi-retired cardinals have publicly questioned Pope Francis' most recent teachings on family life, issuing an open letter to the pontiff with five yes or no questions about how he understands church teaching following the publication of his apostolic exhortation Amoris Laetitia." I get that there are folks who don't like Amores Laetitia, and I (sorta) get why they don't like it. From my vantage point, though, everything I've read (granted, I haven't read the whole thing, but have seen the "challenging" pull quotes) seems pretty great. I don't see a change made to Church teaching. I do see a radical turn toward mercy and a loving pastoral response to people in difficult situations, both of which I'm a fan of. Note (in case you were wondering): It doesn't say that divorced and remarried Catholics can come to receive Communion. "While the exhortation does not contain any change in Church teaching regarding marriage and family life, some have used ‘Amoris Laetitia’ in ways that do not correspond with the Church’s teaching tradition." It's that good ol' "Spirit of" thing we so often do as Catholics that seems to be the problem, rather than an actual correct understanding/reading of the document (see: Hermeneutic of Continuity). Back to the topic at hand: The open and public "dubia" from the four Cardinals is not going to accomplish anything positive, in my opinion. They already know the answers to the questions they have asked (questions like, "Are there absolute moral norms? "), and their asking of these rhetorical questions just seems like a waste of time. Instead of helping to clarify misreadings that some may have of the Pope's document, I see this as serving to split factions within the Church that already have a huge need to move closer to each other, not to mention showing a split within the Church to a public that will have a difficult time understanding just what it's all about (especially since the public tends to view the Church from a policital lens, and this furthers their narrative of the right/left sides of the Church). I know it's borderline heresy to some of you when I say I don't like something Cardinal Burke is involved in, but I'm seriously not a fan of his recent stands against the Pope (note: back in February of 2015, he said he would "resist the Pope" if he felt there was a change to Church teaching, which is okay, I guess, except he said it to a regular ol' media-type who clearly has no understanding of what he meant from a Church perspective, and could have just said that he had no expectation that the Pope would make a change he would be at odds with). In the end, I feel like I just want us to come together, rather than split apart. What hope can we have for Christian unity, if we can't even pull it off within the Church Christ founded? Let's stand with the Pope, rather than hating on everything he has to say. From where I sit, it's obvious he's the Pope we need right now. Tommy, I strongly respect your opinion but I disagree with you here. I assume you read the Dubia, but you may not be familiar with the style--the yes or no, and the style of re-presenting of absolute moral norms are quite common in Dubia written in the past. I'm glad Archbishop Sample said that it does not allow for change, but there are multiple reports of other dioceses taking the opposite views. Take the Argentinian bishops conference, for example. So I view the four cardinals as trying to set straight a teaching that has been confusing for many, and I think that is a good thing. I appreciate your view and I think you make some good points--I don't want division either. Let's hope for the best of both--truth without division. God bless. The issue that you seem to be overlooking is Pope Francis' letter to the Argentine bishops, which supports a Kasperian-style admittance of divorced and civilly remarried couples (even those who remain sexually active) to the reception of the Holy Eucharist. To allow people who are living in a state of grave, public, and manifest sin to receive the Eucharist is to allow sacrilege. As such, it seems perfectly reasonable for the four Cardinals to ask those questions, to affirm that sacrilege is still considered a moral evil, and that Jesus' words in Matthew 19:8* haven't been "invalidated." (Obviously, Jesus' words cannot truly be invalidated or reversed by anyone. But surely you can see the profound confusion that is arising as a direct result of Pope Francis' obstinate and deliberate ambiguity on this issue.) And, lastly, if these questions really require only common sense answers that the Cardinals already know (as I also believe to be the case), it seems odd that Pope Francis has been so reticent to answer them. Even since the Dubia have been made public, there is no evidence that he intends to make any sort of official clarification on the issue. I respect Pope Francis' work to emphasize the Mercy of God. I think there have been many wonderful changes as a result of that work. But just as truth without mercy is callused legalism, so mercy without truth is only unhelpful sentimentality (Bishop Conley). Each is useless without the other. Furthermore, ecclesial unity depends upon individual unity with God, which is impossible without a unification of truth and mercy. I want unity, but not at the expense of Truth. *Matthew 19:8: I tell you that anyone who divorces his wife, except for sexual immorality, and marries another woman commits adultery. Respectfully, I have to disagree. Unity is being threatened bc diocese to diocese different "pastoral practises" are being promoted and it is the fatherly and pastoral duty of Holy Father to correct those in error and unite the faithful in ONE faith and morals rather than whatever the local bishop thinks.